Earlier today, at approximately the same time that France was lamenting Zidane’s headbutt and Trezeguet’s shot into the crossbar, a friend of mine was celebrating her nuptials. That would be the friend for whom I was knitting the Print o’ the Wave stole as a wedding gift. Oops. No edging at all might have been ok. But five repeats of an edging with a bunch of live stitches won’t do. I am not admitting defeat by the stole—it will be finished and it will be gifted sooner rather than later—but I have been wholly defeated by time, or at least my lack of appropriate time management. I’m also going to pre-emptively admit defeat for the baby shower I’m attending on Tuesday. I thought I might be able to knock off some booties, but that’s not looking likely either. In my defense, I only found out about the shower last week. In other knitting news, I’ve joined the Print o’ the Wave Stole knitalong that just started, and if you are knitting this stole, then you should come and join us! The Straight-Laced socks are almost ready for toes. Another 8-10 rounds should do it. Quinn #2? Still dead in the water for the time being. I need to get either the stole or the socks off my plate first before I will be properly motivated to do it. And I am feeling the urge for pink sock yarn and blue laceweight. Because buying more yarn storage means I need to fill it up with more yarn, right? CogKnition posted this on July 9th, 2006 @ 10:43pm in Unfinished Objects | Permalink to "Admitting Defeat"
It doesn’t matter what’s going on in your world, more yarn will cure it! (Or at least help you forget for a little bit). Don’t feel bad about the time issues, we all have them. The stole is still completely lovely. Thanks for the support! 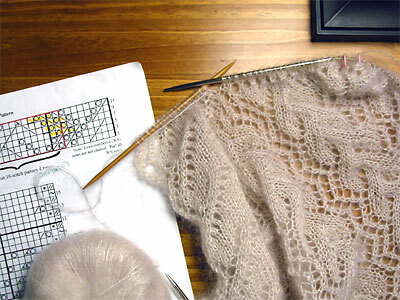 I totally thought I had enough time when I started the stole, figuring that the edging would go quickly once the body was done–maybe, a couple of days of work, tops. Silly me. I did the math last night and apparently the edging contains 40% of the stitches in the stole. Which is why I’m leaving the percentage bar at 60% for now. Well, I’ll say this .. no matter when she gets it, she’s going to love that stole. It’s simply lovely!